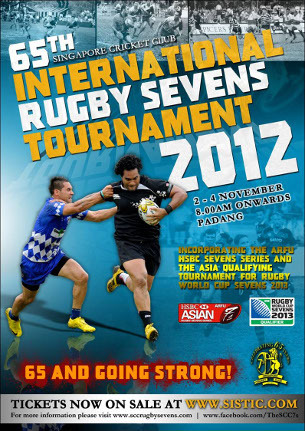 GUINNESS® is proud to announce its continuing association with the upcoming Singapore Cricket Club (SCC) International Rugby Sevens, due to take place on 2nd to 4th November 2012 at the Padang, Singapore. Pitting 20 teams from across the globe against one another to win the coveted Ablitt Cup, the SCC Rugby Sevens which is in its 65th edition this year, is a regional premier club tournament that has established itself as a mainstay on the global rugby sevens calendar. As proud supporter of the SCC Rugby Sevens and the Official Beer for five years running, GUINNESS® welcomes all present to enjoy a pint of the black stuff while soaking in the sport which has gained increasing attention preceding its entry to the upcoming 2016 Rio de Janeiro Olympic Games. Around 15,000 fans are expected at this year’s SCC Rugby Sevens which sees the inclusion of the Asian Sevens Series, where Asia’s top 12 teams will play for the opportunity to represent the region for the Rugby Sevens World Cup Qualifier. Guinness draught will be available for purchase at the SCC Rugby Sevens Village at a price of $13 per pint and $12 per can (440ml). Tickets to the tournament are on sale at www.sistic.com.sg and all SISTIC outlets.